It can be a challenge making a party meal for family when I can’t eat gluten. It got a bit more challenging this weekend when I made a meal for family including my brother. He recently had to go on a low carb diet for medical reasons, he is already slim and exercises a lot. But, now he has to cut way back on carbs. So no burgers with buns, no rolls, no big fat birthday cake for my mom. What to make? What kind of cake could we all eat? I decided to go with this menu: deviled eggs to start, then grilled marinated chicken thighs, my version of doctored baked beans, old school potato salad and a veggie/fruit jello salad followed by a fruity pavlova for dessert. The deviled eggs are always popular; I gave my recipe early this spring for them and no one ever gets tired of them. I made half with gherkins in them and half plain. All gone in a matter of minute. The potato salad is a family tradition; I used my sister Karen’s version because it tastes better than anyone else makes. I knew my mom would be pleased and my brother who probably doesn’t eat such treats except when he visits me. I used Light Hellman’s Mayonnaise and light sour cream in my creamy dressing on the golden potato slices. The seasonings are celery seeds, cider vinegar and some dill pickle juice! I went light on the dressing for the sake of my brother and his wife who doesn’t eat much of any fat. I added some chopped celery and a touch of chopped onion. Yumm! Our family loves the baked beans; made quick and easy with a can of good quality old fashioned baked beans, Bush’s works perfectly but don’t use Campbells; they are just not as good a bean. I often use the Giant name brand and they work great. For fun I put my Perfection Jello Salad in a copper lobster mold. This was for the delight of my 2.8 year old grandson. He knows what a lobster is and loved it when the orange and golden mold was carried out on a large oval platter. My salad is created from lemon jello spiked with a touch of cider vinegar and full of well drained crushed pineapple and shredded carrots. It was pretty and pretty tasty. I thought someone took a picture of it but no such luck. 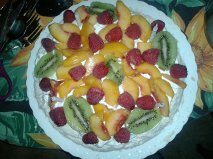 Dessert was a big pavlova meringue which I have posted the recipe to here recently. This picture is from Sunday’s meal. I topped mine with slices of ripe kiwi, ripe local peaches and fresh raspberries as I was low on peaches and didn’t have time to run to Bechdolts Orchard for more…. Everyone devoured their slice and it was accorded five stars by my sister-in-law who doesn’t even eat cake normally. It is fairly low in carbs and you get bites of ripe fresh fruit and tasty real whipped cream on the tender meringue. I put some candles on top and we sang happy birthday in the back yard as the sun set. Perfect birthday barbecue…. Here is an approximation of my baked bean recipe: I never measure but I will do my best to replicate the proportions. Fry the bacon in a large frying pan. I like cast iron best for this recipe but most any pan will do. Once it is about ¾ done to your liking (4 to 6 minutes) add the chopped onion. Cook 4-6 minutes until it is softening. Open the beans and drain off any excess liquid especially any separated thinner liquid. Pour in the pan on top of the onions and bacon. Dump in the rest of the ingredients and stir well. Heat to a low bubble, turn down and allow it to cook slowly for 10 to 20 minutes, stirring frequently so the beans don’t stick and burn. Taste it and adjust by adding more of any of the four condiments. I like it sweet and tart at the same time. I suggest you start with the lower amounts of condiments especially the sugar and vinegar and see how it is after cooking 5 minutes; add more to taste. It is great warm but equally yummy left over cold for lunch the next day. I sometimes make it in the dead of winter for a cold weather inside picnic. Sure you can make the really slow cooked beans in a crock but this is addictively tangy and every member of my family adores it. My mom always made these beans and I finally got brave enough to just dump and create my own version which I must say is remarkably like Mom’s. All in all it was a pretty good family meal, not too complicated as I could make the jello salad in advance and the meringue the day before. The potato salad and the beans could also be made in advance. You would never guess by the menu that this was a gluten free meal or a low carb one; just good old school yummy-ness on our plates!